August 14, 2014 I lost my Dad and August 24, 2015 I lost my daughter in law. The one thing I have learned over this incredibly hard year is that grief is not “one size fits all”. People expect you to grieve a certain way and on a certain time frame and without exception I have found that doesn’t happen. People may tell you they know how you feel but they don’t. Your pain, your grief and your hurting heart are exclusively yours. The process may be similar but your process belongs to you only. The pain is inescapable and oftentimes it feels like much more than we can handle. The emotions are incredible, deep and quite honestly confusing. I am a woman, I am used to emotion, but this many and all at once are overwhelming and painful. At times it feels like an emotional ambush and there is nowhere to hide. I still find it hard to believe that I have had my last visit with my loved ones, that there will be no more heart to heart talks, no more shared meals and the hardest part is our favorite holidays will never be the same. I am not ready to say goodbye. I want to say I love you one more time and I want to hear it back. I have found great solace in Psalm 10:14a. The scripture assures me that God sees our trouble and grief and takes it into hand. Although grief and sadness are hard to walk through I do believe that they are necessary and we should not suppress this natural process but rather seek God’s help to walk with us. So how do we handle this mind numbing pain called grief in a way that still glorifies God? I love God with my whole heart and soul, but it is very hard to come up with a reason that our family has had such tremendous loss in a relatively short time. That makes it hard not to be just a little bit angry at God. I have to take great care to make sure that does not happen because in my opinion that would be aiming my anger at my biggest ally and not the enemy. DON’T DWELL ON THE QUESTION…………..WHY DID THIS HAVE TO HAPPEN? Whether expected or not death hurts. The death of our loved one may have surprised us but it did not surprise God. God has absolute sovereignty over all life and death. He has ordered every single last detail over everything, even death. Run to Him who knows you like no one else and loves you as no other. Run to where comfort can be found. You will only find real and lasting comfort in our Lord. When your heart is breaking and you are blinded by mind numbing grief, don’t let sorrow blind you to temptation. Satan will use this time to cast doubt on God’s goodness and love. Deny the feelings of doubt, self-pity, bitterness, anger and run to God for strength. Live thankful that even in the darkness we will find God’s presence and His love. Look beyond this moment and take comfort in the fact that, as Christians, someday the grief will end and your eternity is with God. So I will grieve, I will grieve in my own personal way but I will grieve with hope. I am thinking about a couple of popular quotes this morning. “It’s the journey, not the destination.” That seems to be a trendy quote especially among the motorcycle crowd. While an argument can be made for both quotes I think rather more to the point is, always remembering the correct way to your final destination. Each of us are on a journey to a destination. Not to confuse things further but you have to take your journey to achieve your destination. Each journey is individually unique in a specific way. 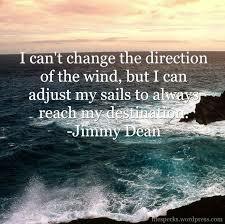 It seems to me the way you conduct your journey will ultimately determine your destination. While it is important to enjoy the journey and it is desirable to achieve, and to accomplish and even to acquire in this life, that cannot and should not be the entire purpose of the journey. Nor I suppose, should the entire purpose be to have our lives resemble an ongoing party. Although on the surface that seems quite fun. Go ahead and pursue the big things and the fun things, but not at the expense of the little but important things and not in a way that puts your chosen destination in jeopardy. Yesterday a hard lesson was driven home to me, well a couple of things actually. 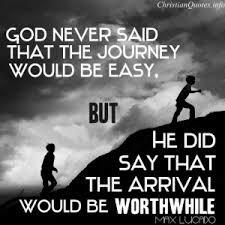 Quite frankly the journey matters a great deal, but determining your eternal destination is the most important decision you will ever make. It is only when you have decided where your destination will be that you can plan your journey accordingly. Don’t put off what really matters for the things that are simply desirable. Enjoy your family and friends, and nurture those important relationships. Build your journey around what God would have you do. To say that the journey is more important than the destination is to say what you are experiencing on earth is more important that where you will spend eternity when you reach your destination. It denies the significance of your destination. Perhaps the most important thing is to always remember your destination. Don’t get sidetracked on your journey for you NEVER know when you will achieve your goal and it is important that you have worked to get to the right destination. How do God and Motorcycles mix in my life? Contrasting learning to ride a motorcycle with learning to trust God. I know, you are thinking, WTHeck????? But wait, bear with me here, I think I can connect the dots for you. You will have to read the whole devotional and connect the part about the motorcycle with the part about God. I started riding a motorcycle in my early teens but then I grew up and life interfered. A husband, kids and a job will do that. I do remember the exact time motorcycles entered my life again, that is what I want to talk about. It was a huge decision to take up riding again. Did I want to step outside my comfort zone and get into something so strange and new? Then there was the consideration of safety and oh gosh, what would my friends and family think? The wind in my hair, the strange comradery that only bikers experience, the incredible freedom. But most of all the feeling of being one with creation. Soon however I felt a stirring in my soul, I loved riding with my hubby (except the crazy entrance into one gas station parking lot but again, that is another story) I wanted this experience on my own bike, in my own way and when I chose. I took the Motorcycle Safety Course, bought a new bike and set out to follow what was in my heart. Learning to ride my motorcycle was not quick and it took some courage to climb in that saddle and go it alone. It was one thing to ride pillion and quite another to go it alone. I studied books about safety and technique, I talked to other motorcycle riders and watched tons of You Tube videos about riding motorcycles. Although all that was beneficial NOTHING worked as well as simply gathering my courage and climbing in the saddle and just riding. That is not to say that a mentor is not valuable, it is, but it won’t work unless you finally gather the courage to climb in that saddle and ride! I remember my hands shaking so bad because it was so scary, but I kept on riding. I remember dodging those stupid suicidal packs of turkeys and other animals in the roads, but I kept on riding. I never felt so good as when I rode. I remember learning to navigate the gravel, learning to park (uugh), learning to ride in a group. It was unnerving at times but I kept on riding. I can honestly say that I have found something in riding a motorcycle that I can find nowhere else. It has become a part of who I am and a part I cherish. My Dad and Mom took my brother and I to church every Sunday. It was a part of our life but I have to say quite honestly that it was not a big part. Maybe the best way to put it was that it was another part of our social life in our small community. I certainly was not serious about a relationship with God at that point but it was fun to go see my friends. I grew up and life changed for me, marriage, kids, jobs, etc. God started to knock on my heart but I was hesitant, did I want to step outside my comfort zone and get into something so strange and new? 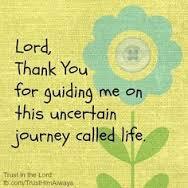 My life would have to change considerably if I was serious about getting to know God and what He offered. And oh gosh, what would my friends and yes my family think? There was a church right beside where I was working at the time and one day I decided to stop in and see what the pastor had to say. After that visit I knew I had to dig further into the idea that God could offer an influential and life changing chance for me. At first it was mostly getting to know the other members of the church and becoming accepted and slowly I started feeling at home. I was feeling the comradery that only other believers can offer and starting to feel one with my Creator. Soon I felt a stirring in my soul and as much as I loved my new church family I wanted a one on one relationship with God. That would involve striking forth with just God and me. SCARY. So I bought a good study Bible and scheduled daily time to follow what was in my heart. Learning about God and to trust God was not quick and it took some courage to change it from a social function to a personal passion. It was one thing to go to church every Sunday and participate in all the fun gatherings and quite another to start to turn all my decisions, thoughts and actions over to God. I studied, I talked to my pastor, I spoke with trusted Christian friends and although that was beneficial and probably necessary, nothing worked as well as simply saying, Here I am God, Do with me as you please. There are times that I shake from fear and uncertainty, so I open my Bible and I pray. I dodge plenty of roadblocks but I open my Bible and I pray. I have navigated all the things that satan has thrown down in my road and yes it is unnerving but I keep on going to the Great I Am. I can honestly say that I have found something in my relationship with God that I can find nowhere else, (not even my motorcycle). It has become who I am and a part I cherish. 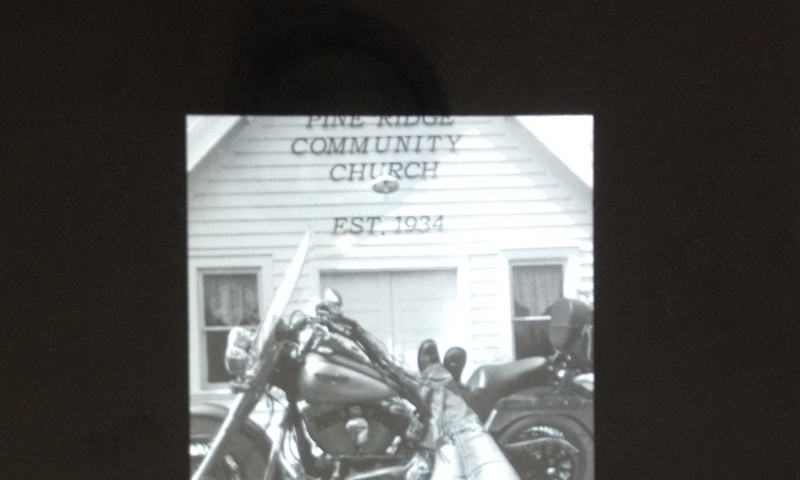 So you see, my walk with God and my love of motorcycles came to me on similar paths. Not everyone will understand this sentiment and I am betting that anyone who doesn’t ride with have an especially difficult time grasping why the similarities are amazing to me. I love God with my whole heart and trust Him with my life. He let me know with absolute certainty that I need to get out there on my bike where just not everyone can go, and spread His words of life. That is one command that I intend to fulfill. Ecc. 3:1-8 is quite simply life summarized. 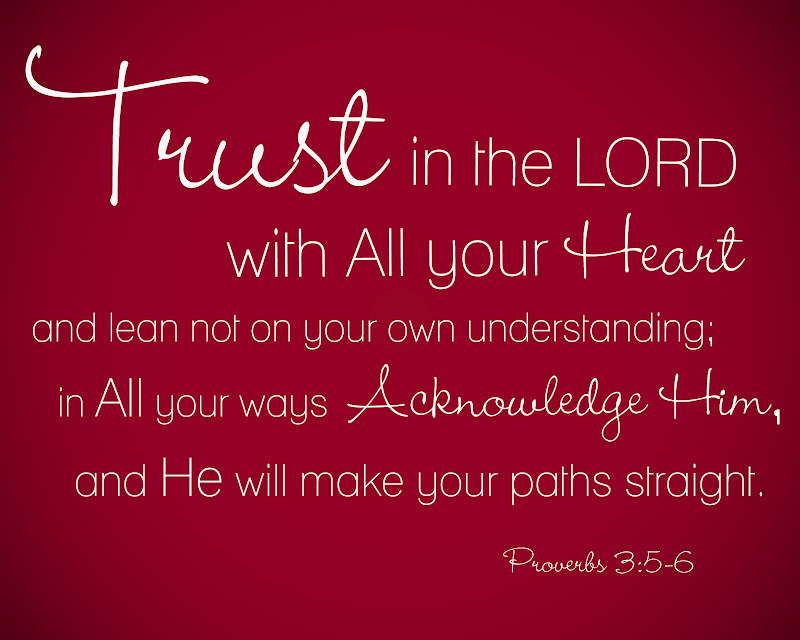 Ecc 3:5 took me awhile to connect with. I spent an hour this morning researching this piece of scripture. Every Bible commentary, every devotional and everything I could find had a little different slant on the same verses. Then God said, close the books, shut off your computer and open your Bible, let me tell you what are in these verses for you. This has been a great study for me and an amazing time with God. Ecc 3:5 has significant meaning to me at this particular season in my life. God has plopped me in a situation where I have ample time to study and pray over what it is He is wanting from me and where He needs me to go. I believe He is helping me to discover the beautiful and unique rhythm of my life. 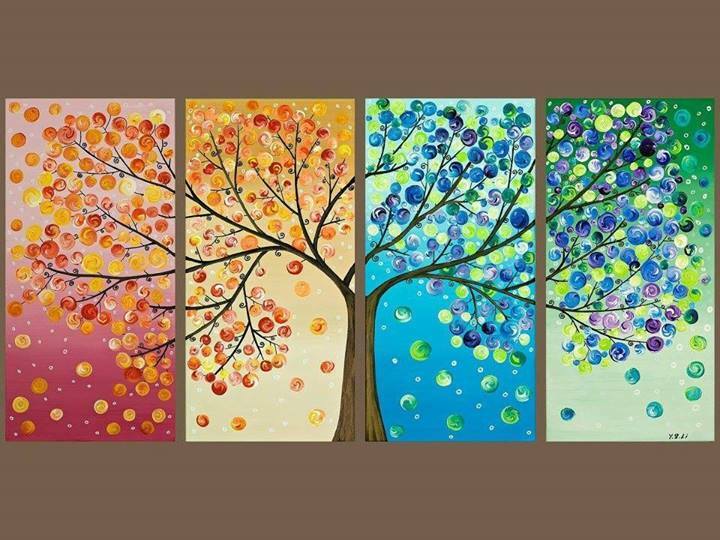 I believe that God uses all the seasons of our lives to shape us into what He desires we be. I am going to take this verse a little out of order but this is what God is giving me this morning. “A time to embrace and a time to refrain from embracing.” At this time in my life and maybe yours also, God is helping me to see and act upon the things I need to embrace and to understand those things that I need to refrain from embracing. He is giving me good and wholesome things in my life that are morally and ethically right. He is wrapping those things (and people) around me and giving me the opportunity to soak in the light. He is giving me a complete feeling of thankfulness for this chance. With that growth I am finding the strength and wisdom, with His guidance, to refrain from embracing those things that are not good for me and tend to bring me down. When those distracting and destructive thoughts come, I am finding the power to cast them far from me, with His guiding hand of course. Hand in hand with those things is the fact that God is helping me to gather the stones of who He is, what He represents and what that means to me. The stones I am gathering are helping to build a solid foundation that no one can knock down. Stone by stone I am learning the attributes of God, I am learning just how much He loves me, I am learning to love and revere this most important relationship. The wonderful thing is the stones are only representations of what is being built inside me. I can now take those stones of knowledge, truth and light and cast them towards those who long to find that solid foundation that only God can offer. I guess to summarize it can best be put this way. God gives us seasons, He will call us to gather in some seasons, where we will be active and productive. In some seasons he will call us to scatter that which we have gathered. He will call us to embrace the good things and He will give us the reserves to refrain from embracing those things which would tear us down. For some this might very well be a series of separate seasons, but for me He has combined this into the same glorious and wonderful season. I think you Lord for the wisdom and joy I am finding in this season. I read something on Facebook that gave me food for thought. I read something to the effect of “Don’t just tell them what God can do for them, tell them who God is”. Wow, that certainly is something to think about. How often do we tell others of the wonderful things that God can and will do for them but fail to tell them who God is? Think about it………… why would you turn your life over to a God you didn’t know? Another reason that this is beneficial to me is when times are tough we tend to forget just who God is and what He is capable of. I want to find out more about who God is! I started at the beginning Genesis 1:1. I find it interesting that the Bible doesn’t attempt to prove that God exists, it assumes His existence from the start. The very first statement in the Bible says “In the beginning God created the heavens and earth. 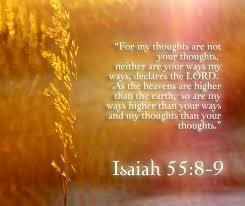 • Isaiah 55:8-9- God does not think like us. Ours is not the last word on right or wrong, so don’t rely on our own understanding, rely on God. • Romans 11:33-36, Proverbs 3: 19, 20– God is wisdom. God governs His creation with justice, love and power. We strive to gain wisdom in all we do, getting college education, work experience, life experience, not that any of that is bad…..but the wisdom we should be seeking with the same fervor is God’s wisdom. • Psalm 50:21 lets us know that God is not like us. • Psalm 90:4- God is not limited by time. Our world is a physical world with physical limitations. God dwells in the spiritual realm and is not limited by the same things we are. Time is irrelevant to God, He transcends Timex! • 1 Corinthians 1:25- God is not dumb or weak…..”for the foolishness of God is wiser than man’s wisdom and the weakness of God is stronger than man’s strength. • Psalm 145:18 – God is near and we can go to Him in truth. God wants us to talk to Him and He wants to be involved in all that we are and all that we do. He wants to know us and be known intimately. Sometimes I think we tend to want God to know us intimately so He can help us but we don’t make the same effort to get to know him intimately. • Psalm 147:5- God is mighty in power, and His Unchanging Omniscient understanding has no limits. Think about this. God’s power, He spoke creation into existence, He fixes things for us on a prayer request if it is His will. I believe that He wants us to know of His power and to rely on it. 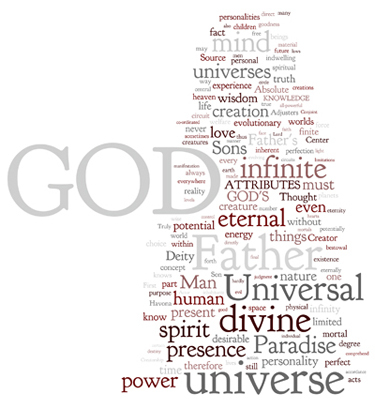 Just a few other characteristics of God. Keep in mind this list is by no means inclusive. No list could every contain the character of God. I do not know one other person with such an impressive list. I believe I shall follow God. For some change is exciting, easy and keeps our lives interesting. For the rest of us the unknown is scary, intimidating, and way out of our comfort zone. However, there is one thing change is and that is inevitable. When you come to the realization (whether it be comfortable or not) that God is telling you this season is over and it is time to uproot from the field where you have been planted, there is one way to make the transition easier to tolerate. Remember that God is the Alpha and Omega. Isn’t that a comforting thought? God is the beginning of everything we experience and God is the ending of all we experience. Common sense would tell you that means He is all throughout the middle of our transitions also. Let’s look at what the word transition means. To transition is to change, evolve, move, and shift or to have a conversion. That could full well mean that to have an effective God driven transition there may be areas in our lives that we need to rework if we see we are not on track with what God has planned for us. The only way to determine this is to seek God in a humble, submissive and true way. Consider where you have been and where God is leading you and decide to submit to His destination. It is during this inner study that you may discover that God’s plan is far different from anything you were considering. It is also safe to bet that the work God is doing in you is far more exquisite than anything you ever imagined. Go ahead, Just Do It, if God is in control it will be better than you ever imagined.